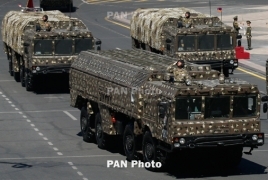 PanARMENIAN.Net - Armenia is planning to acquire modern, precision-guided missile, artillery and anti-aircraft systems, according to the government’s five-year plan. The government to adopt improved resource management and accountability mechanisms, which will offer efficient solutions and help fight corruption. The army will also get multifunctional aviation and automated and robotic air and ground systems. Under the program, the development of the domestic arms industry will be the most important component of security. Measures will be taken "to ensure that the armed forces management system is largely automated, having sufficient operational efficiency, viability, mobility, and technological supremacy for military operations."